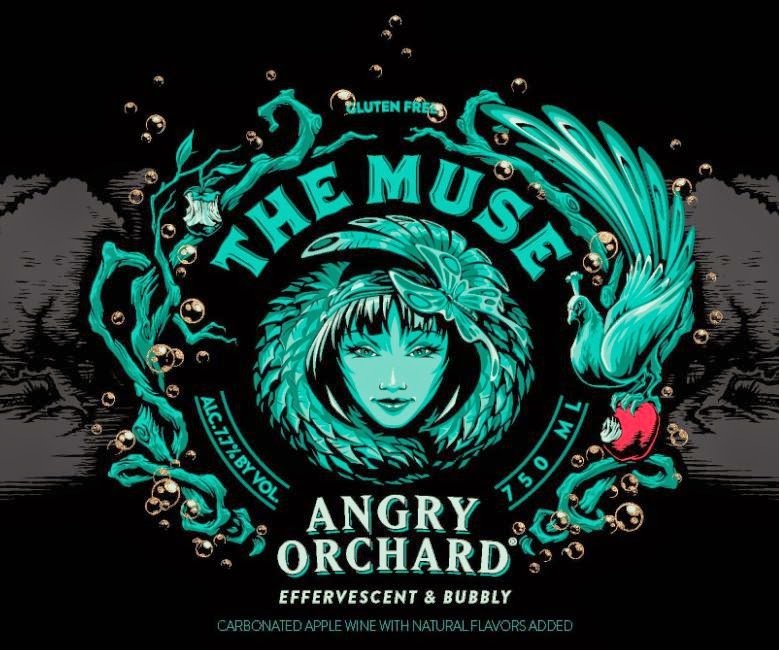 Angry Orchard Cider Co. just announced the addition of The Muse to its Cider House Collection of specialty ciders. The details are listed in the press release below. While I primarily drink beer, I do enjoy ciders from time to time. I just can't drink overly sweet ciders, so I tend to avoid the mass-market options. I haven't tasted The Muse yet, but it seems intriguing to me for a few reasons. First, it's semi-dry. I enjoy a touch of sweetness in cider--but not too much. Next, inspired by sparkling wines, the added effervescence should help to lighten the body. Finally, I'm a big fan of anything aged on oak, as it can add spicy notes and an extra softness to the mouth feel. The Muse sounds great on paper. I'll have to give it a try and see how it compares! CINCINNATI, May 1, 2014 – This spring, the Angry Orchard Cider Company is releasing a new year-round Cider House Collection specialty cider - The Muse. Inspired by the festive nature of slightly sweet demi-sec champagnes and sparkling wines, the cider makers at Angry Orchard experimented with select apple blends, wood-aging and fermentation methods to create this specialty release. The Muse is an effervescent, fruit-forward cider perfect for celebratory occasions or as an unconventional alternative to white wine. First launched in 2012, Angry Orchard is the number one selling hard cider in the US, and continues to introduce new hard cider styles to drinkers who are exploring hard cider as a beverage alternative to craft beer and wine. The Muse has a distinct juicy apple aroma and is slightly sweet upfront, balanced by a bright acidity, and finishes slightly dry with a lingering flavor of sweet, fresh apples. The newest addition to the Cider House Collection is aged on French oak staves, which adds a subtle wood impression and imparts notes of clove, cinnamon, nutmeg, allspice, and hints of vanilla. To craft this demi-sec cider, the cider makers used a blend of culinary apples from the Südtirol, also known as the Alto Adige region of Italy, a fertile valley known for wine making. Apple juice is then added from traditional bittersweet apples grown in Normandy and Bretagne, France, a region with a historic and thriving culture of growing apples unique to cider making. With the addition of The Muse, the Cider House Collection expands its portfolio to three specialty ciders, including Iceman and Strawman, all offered year-round in a 750ml, corked-caged bottle. The Muse complements a variety of foods and is perfect for celebrating drinking occasions or for sharing with a friend over dinner. This well-balanced, fruit-forward specialty cider, pairs well with a broad range of flavorful foods, from spicy to creamy dishes. With its medium body, light effervescence and alcohol content of 7.7% ABV, The Muse also pairs well with dishes of varying weight and texture, from creamy goat cheese to grilled chicken. Similar to a white wine, the Cider House Collection ciders should be served cool, but not cold, around a temperature range of 45-52˚F. The Angry Orchard Cider House Collection ciders are similar to wines as they use a select blend of apple varietals to create a balance of tannins, acidity, and sugars and are fermented with a carefully selected white wine yeast to showcase the apples’ complex and extraordinary flavors. In addition to The Muse, the Cider House Collection features Angry Orchard Iceman, inspired by traditional Quebec ice ciders, and Angry Orchard Strawman, an American take on a French farmhouse cider. Strawman was influenced by centuries-old European farmhouse cider making techniques and pairs perfectly with a variety of cheeses and charcuterie, while Iceman took cues from the traditional ice ciders of Quebec, creating a cider that is both delicate and sweet and a perfect pairing for desserts. The collection’s unique apple blend and fermentation methods make these ciders suitable for all occasions. The Angry Orchard Cider House Collection is now available nationwide for a suggested retail price of $14.99 - $17.99 per bottle (price varies by market). Angry Orchard Cider Company's cider makers have been experimenting with apple varieties and unique flavors to develop cider recipes for almost 20 years. Angry Orchard's hard cider line-up – Crisp Apple, Apple Ginger, Traditional Dry, Elderflower, Iceman and Strawman – first experimented with a blend of Italian culinary apples from the foothills of the Alps and French bittersweet apples from Normandy. Year-round style Green Apple and seasonals, Elderflower and Cinnful Apple, are made with apples from the Pacific Northwest. The apple juice goes through a lengthy fermentation process, with some ciders aged on oak for additional complexity and balance, before bottling. All Angry Orchard hard ciders are gluten-free. Angry Orchard Crisp Apple, Apple Ginger, Traditional Dry and Green Apple is available year-round in 6-packs for a suggested retail price of $7.99 - $9.99 (price varies by market). Angry Orchard Crisp Apple is also available on draft nationwide. Angry Orchard Elderflower is available April through August in 6-packs for a suggested retail price of $7.99 - $9.99 and in variety 12-packs with three other Angry Orchard styles, Crisp Apple, Green Apple and Apple Ginger, for a suggested retail price of $14.99 - $17.99 (price varies by market). Angry Orchard Cinnful Apple is available September through March. To find where Angry Orchard hard cider is served near you, visit the "cider finder" at www.angryorchard.com/find-angry-orchard/. Cider lovers can explore the orchard online at www.angryorchard.com, like us at www.Facebook.com/AngryOrchard, and follow us at www.twitter.com/AngryOrchard. Angry Orchard, Iceman, and Strawman are registered trademarks of the Angry Orchard Cider Company. 2 The Cider House Collection (The Muse, Iceman and Strawman) is not available in Pennsylvania, New Hampshire and Virginia.